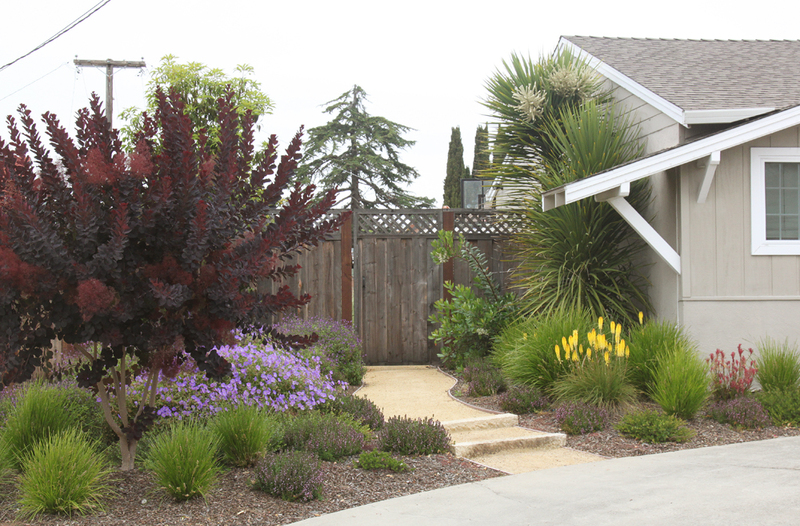 I try to do one or two posts about lawn-to-garden conversions every spring, sort of an annual contribution to the anti-lawn propaganda movement. So far this is the only one I’ve photographed this year. 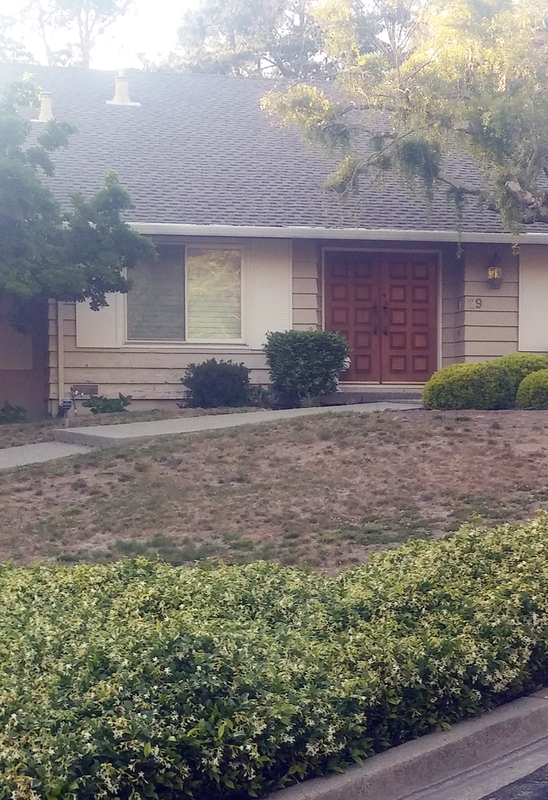 I don’t have a lot to say about it, just that it seems clear to me how much better the planting looks than the lawn. 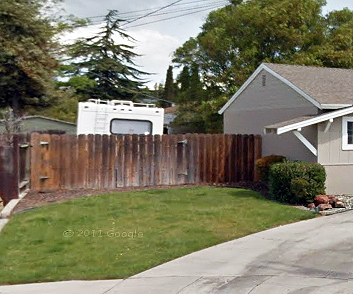 I guess the previous owner kept the lawn so it would be possible to drive a camper van to the backyard. You can’t drive into the backyard anymore. 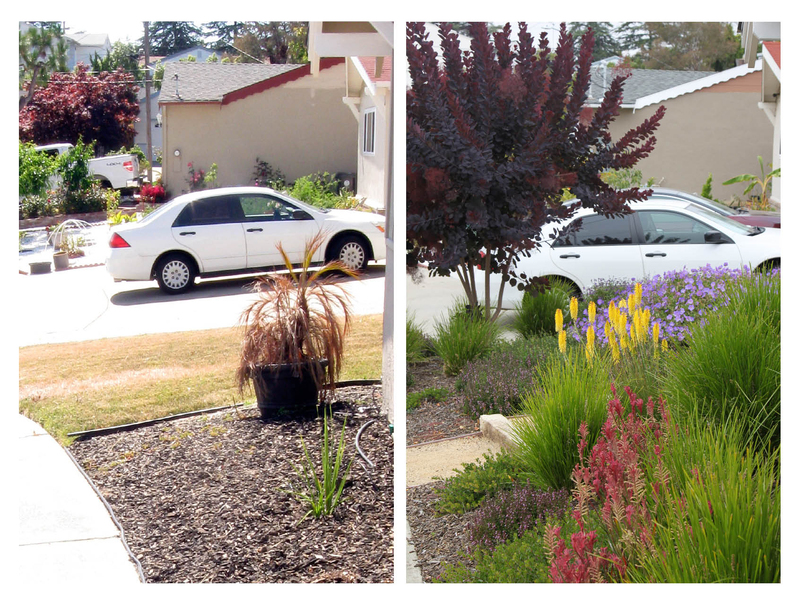 During the drought the new owner let the lawn dry out, then we replaced it with this simple little planting — mostly evergreen, some purple flowers and purple foliage, a bit of eye-catching yellow when the Kniphofia blooms, low-water, relatively low-maintenance, plants that are long-lived and can survive the unskilled ministrations of the mow-and-blow gardeners. 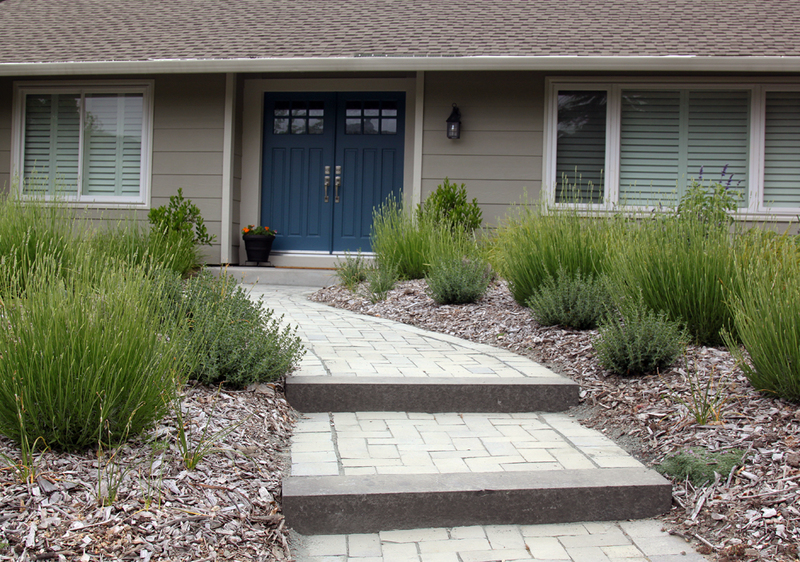 Like many lawn conversion projects, it needed a low-cost path through the planting and, in this case, a couple of steps made with granite curbstones. Pretty straightforward, and such a huge improvement. 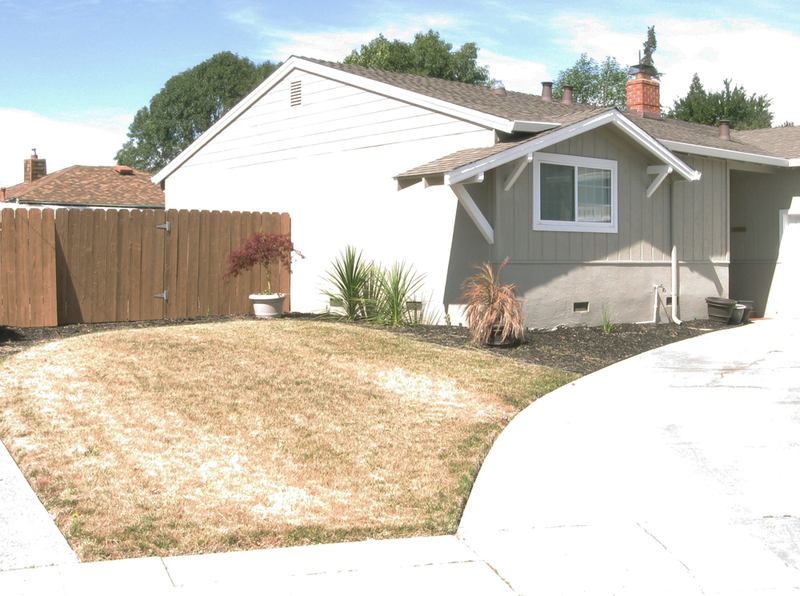 These are the kind of ‘before and after’ images that I think about when I get pushback against the idea of removing front yard lawns. 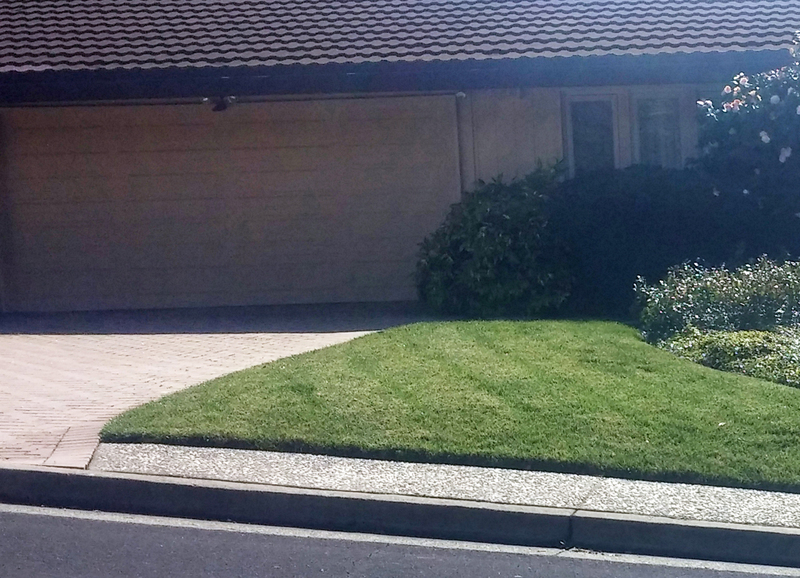 I really struggle to understand why people cling to their lawns. 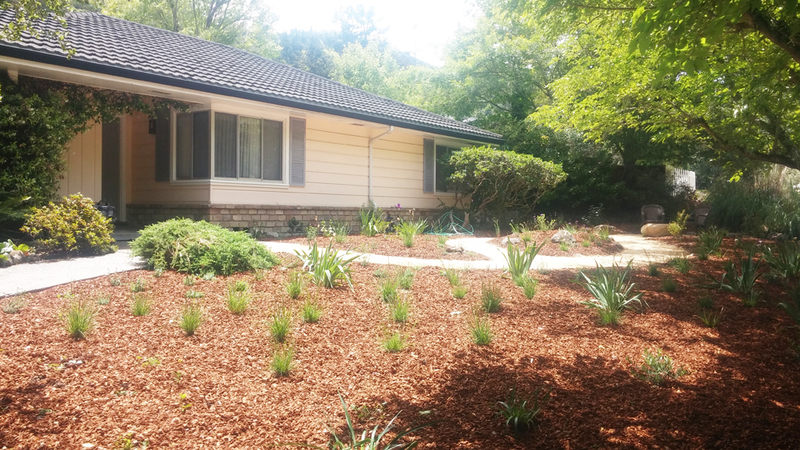 We sheet mulched over the dead lawn, but more to smother weeds than the grass. 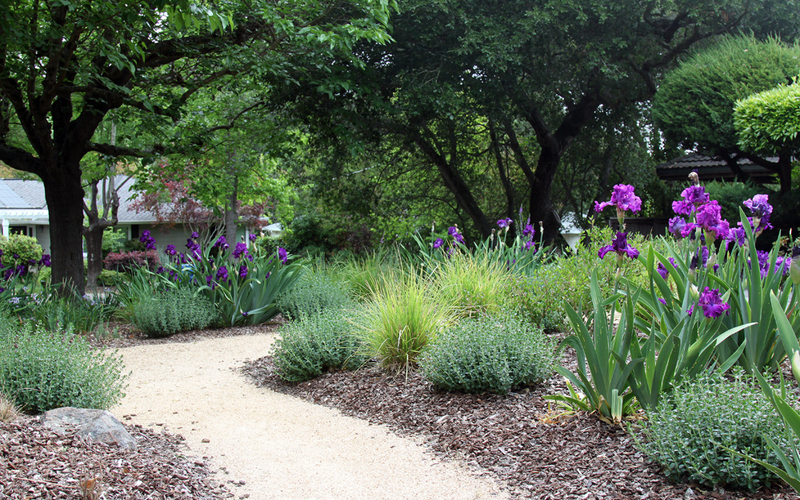 The grass was pretty well dead by the time I first saw it, and to me the planting brought the space back to life. 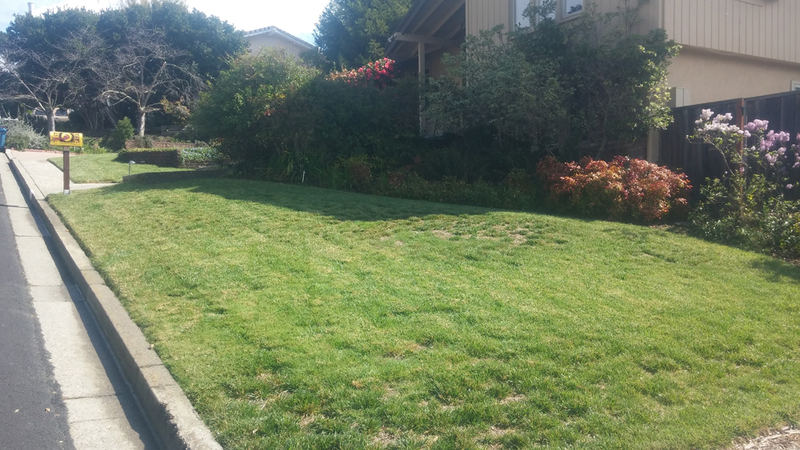 This lawn conversion is around the corner from the last one I showed. 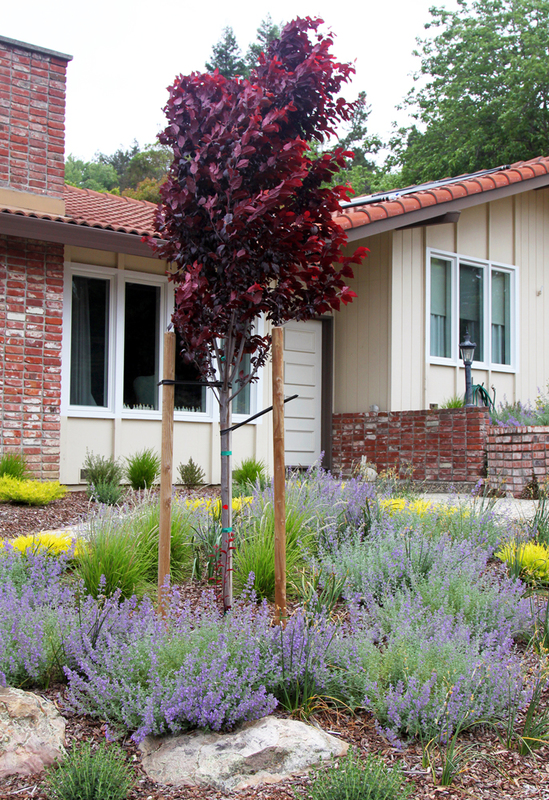 The lawns were similar, full sun and gently sloping, and we used a lot of the same plants, emphasizing purples, yellows, and green. It’s a bigger space, though, so things are on a somewhat bigger scale. 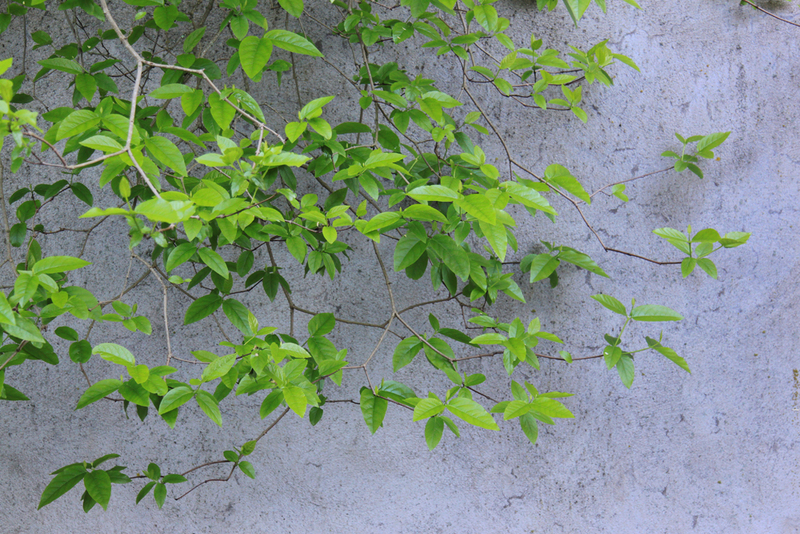 Instead of one Chinese Pistache, we planted 3 Raywood Ash, and instead of one Plum we planted three Nyssa sylvatica. 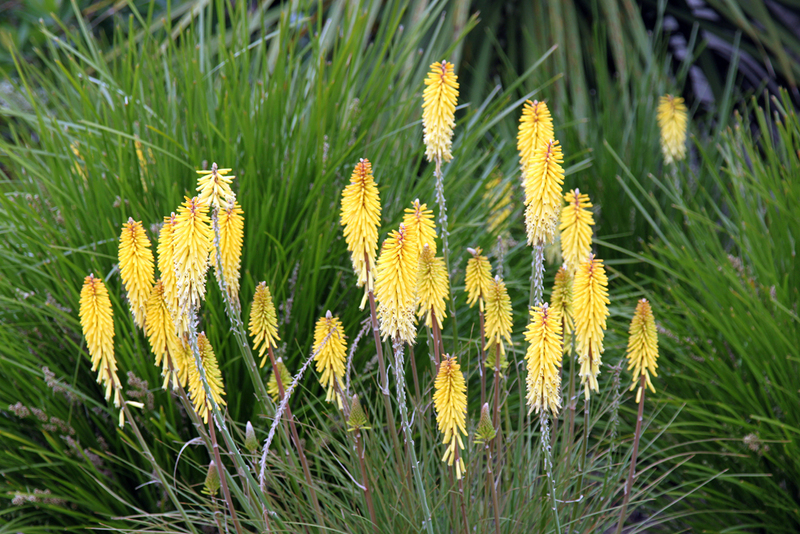 Instead of Sesleria autumnalis we used a larger grass, Lomandra ‘Breeze’, instead of fifteen Salvia nemerosa, there are twenty four. 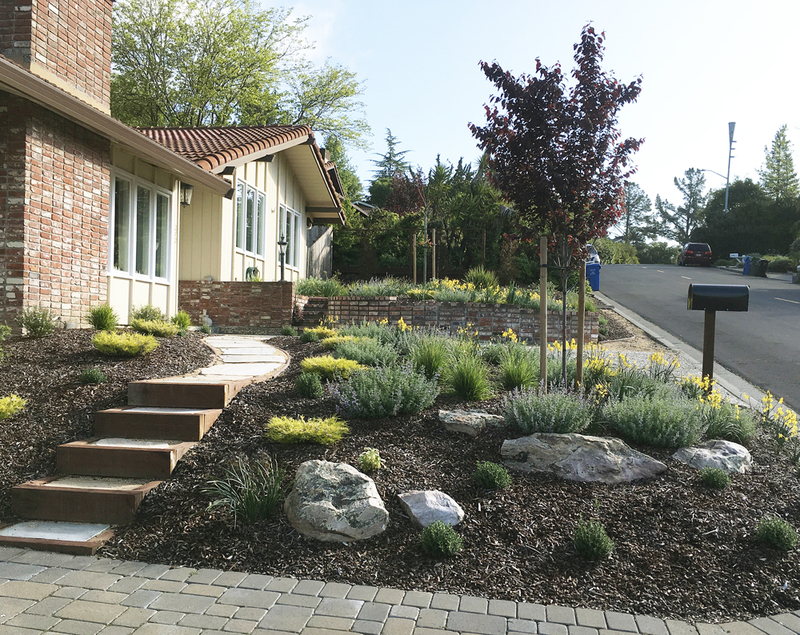 Overall though, it’s fairly similar, a plant palette we use regularly for front yards on that side of the hills — low-water, lowish-maintenance, deer-resistant, a mix of natives and other mediterranean species emphasizing purples, yellows, and green. 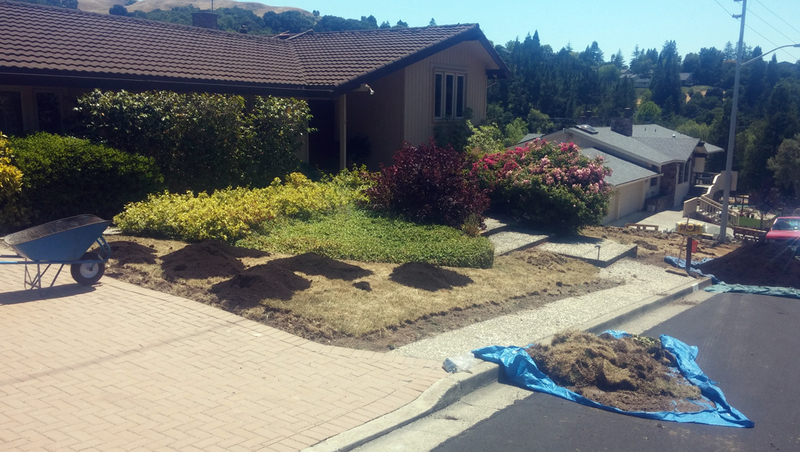 We covered this lawn with mulch from cutting trees in the yard and left it for six months while there was work done on the house. 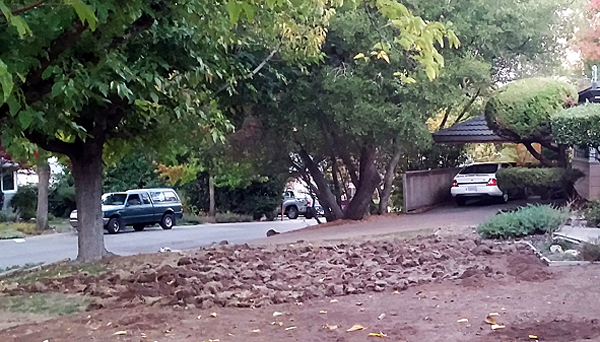 The mulch layer was partly to smother the lawn, but also to protect the soil from the construction workers, who always seem to park on the lawn despite efforts to dissuade them. 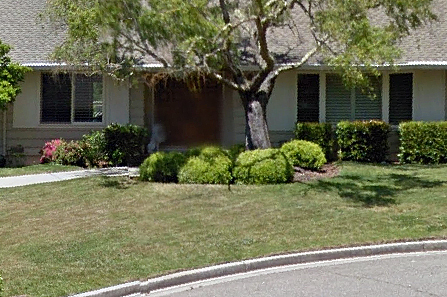 The original landscape didn’t have a pathway to the front door. 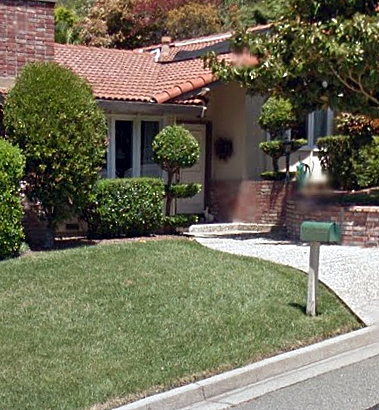 There was one from the driveway to the door, but visitors parked at the curb and walked across the lawn. I’m not sure how that was tolerated for so many years. Visitors should have a proper way to get to the front door. 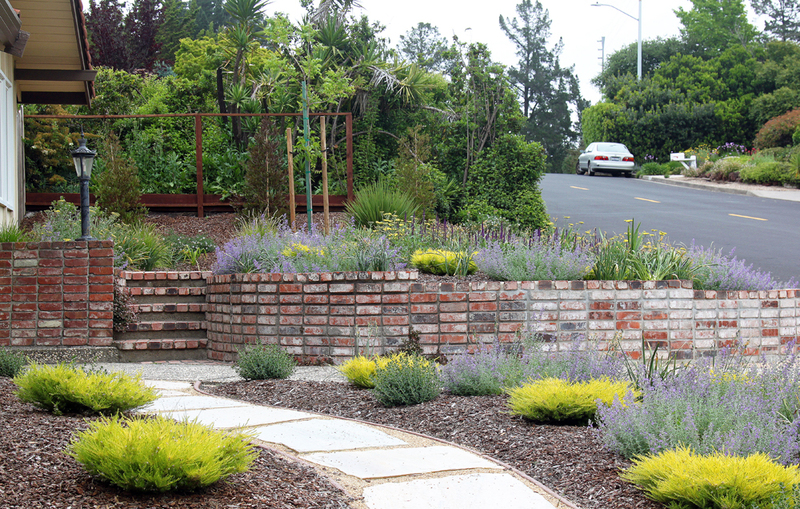 The path uses three different types of stone. The stone sleepers are flamed basalt, the fill pavers are handcut setts of black limestone, and the soldiers are tumbled granite. 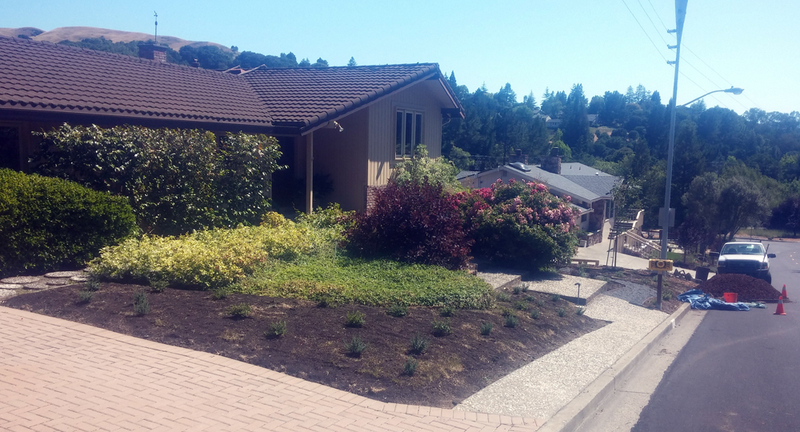 As I was said at the top, this is one of our standard Contra Costa lawn conversion plant palettes. 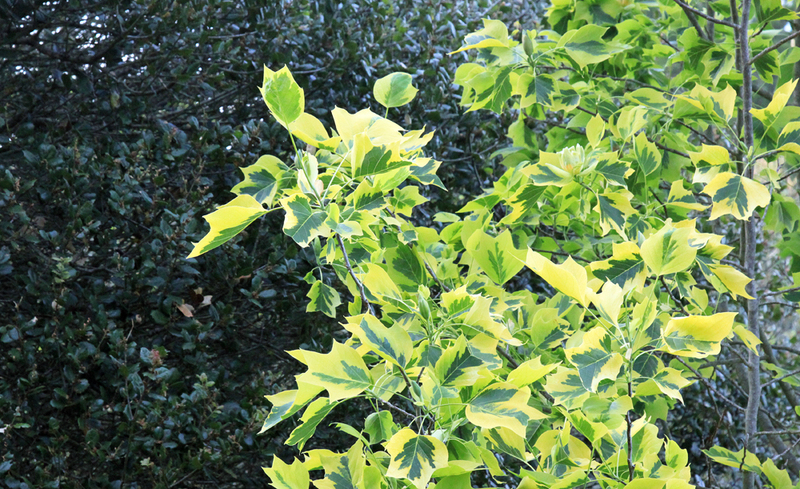 Purple and yellow/gold with mostly green foliage. 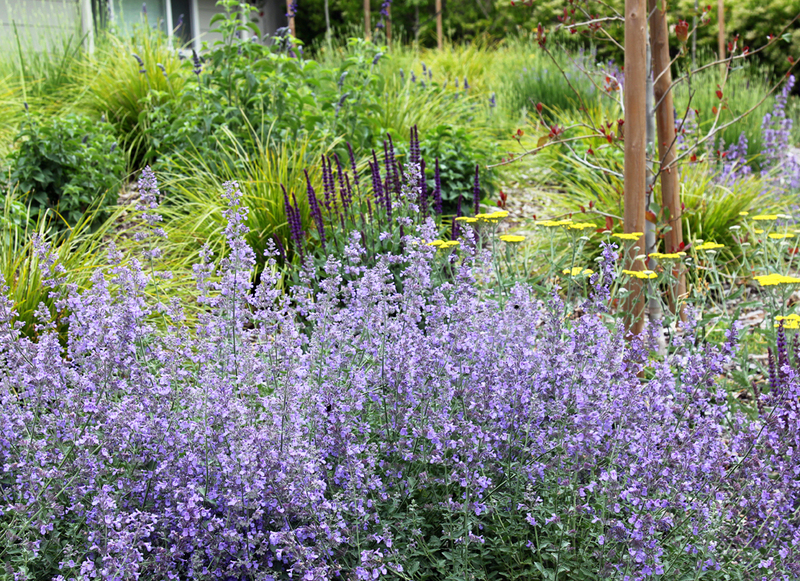 Nepeta, Salvia nemerosa, Penstemon heterophyllus, and Geranium ‘Rozanne’ are the purples blooming now. 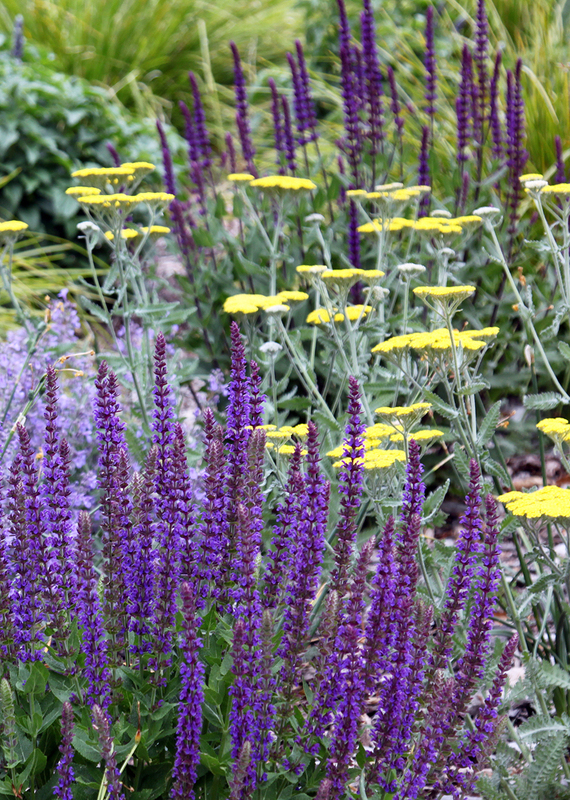 Lavender and Salvia ‘Mystic Spires’ will add more purple soon. 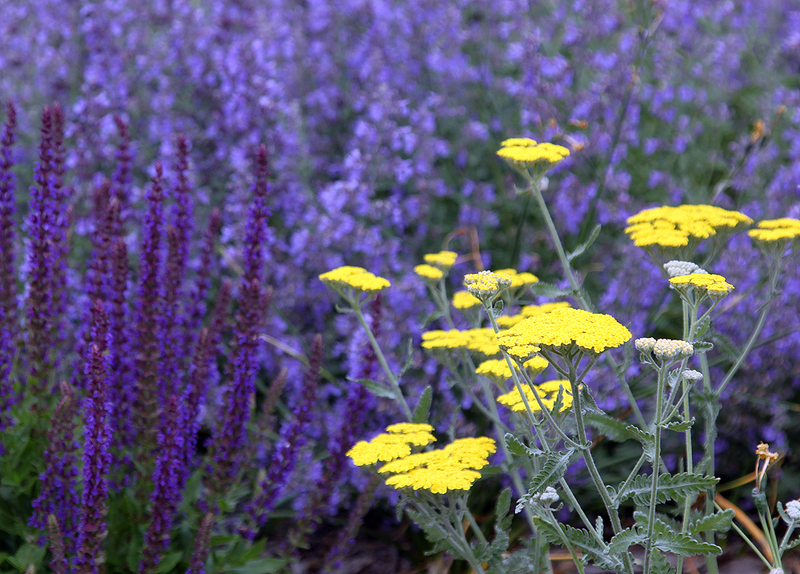 Moonshine Yarrow, Coleonema ‘Sunset Gold’, and Geum are compatible yellows. 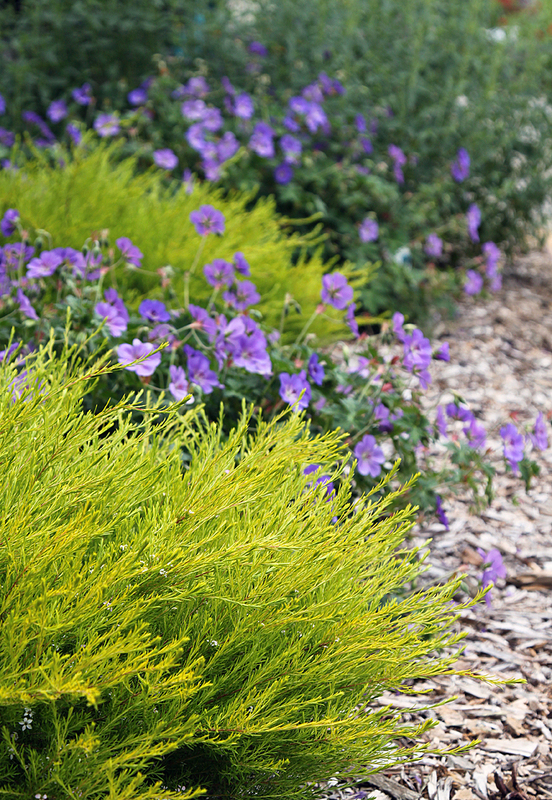 Lomandra ‘Breeze’ is a nice green backdrop, gives it a meadow-y feel. 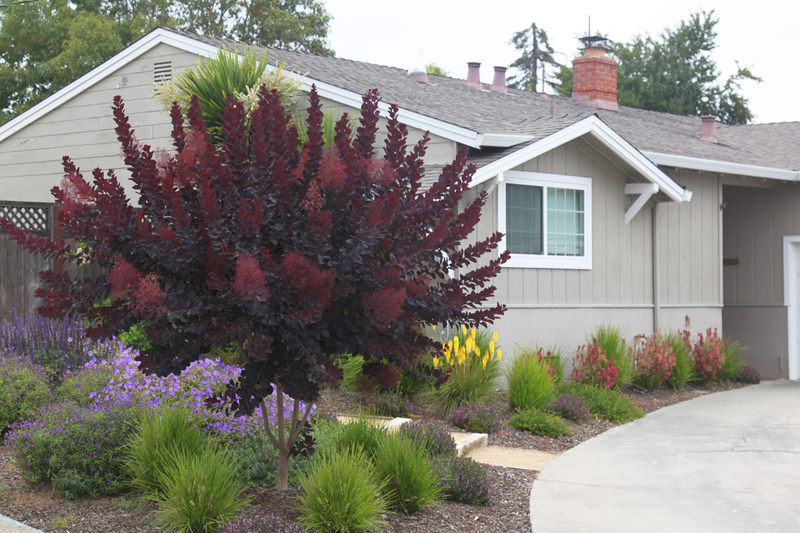 There are young shrubs in the background and of course the trees which are still getting established, but for now, while everyone is first looking and judging the lawn conversion, these are the plants they see. 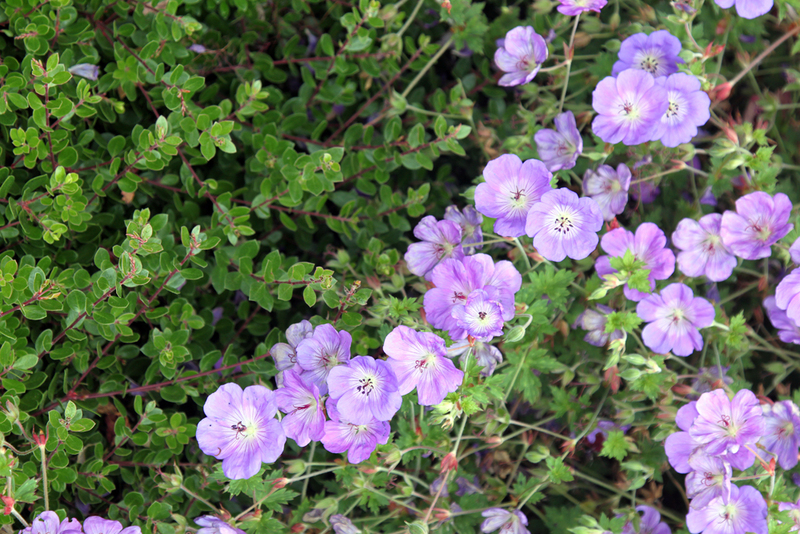 The geranium and geum can be eaten by deer depending on the garden and where they are located in it. Salvia nemerosa ocassionally gets nibbled as well. I’ve never seen any of the others eaten. That concludes lawn conversion week (month) here at DryStoneGarden. There are a lot of resources out there for people considering doing it. Davis has a thorough pdf that I was looking at recently, the latest one to catch my attention. Anyone considering it should go for it. 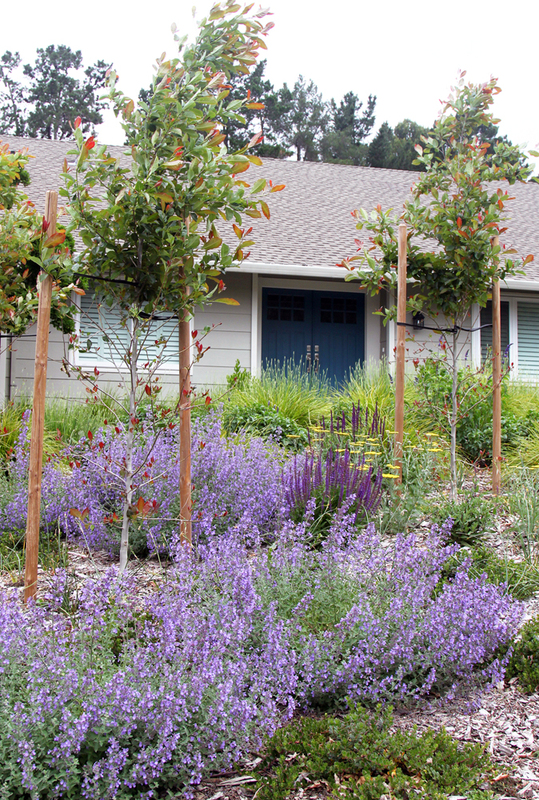 A garden is so much better than a tired old lawn. This is a lawn conversion we did a couple of years ago. 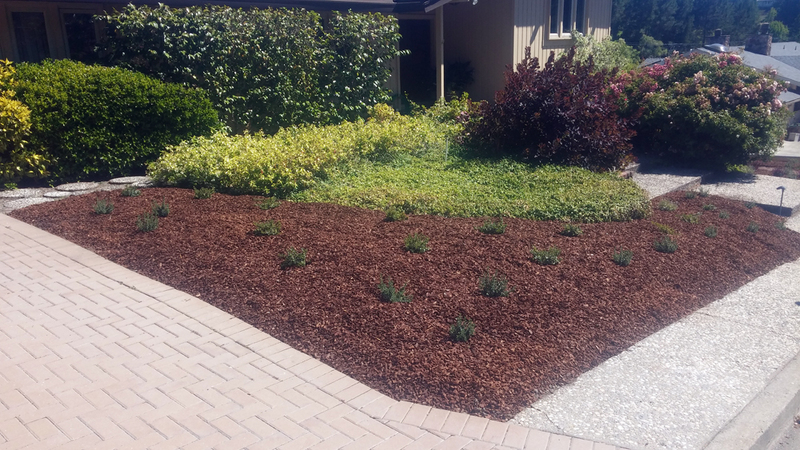 Usually we convert lawns by leaving the lawn in place and covering it with sheet mulch. I’ve posted about the process in the past. This one was a little different. 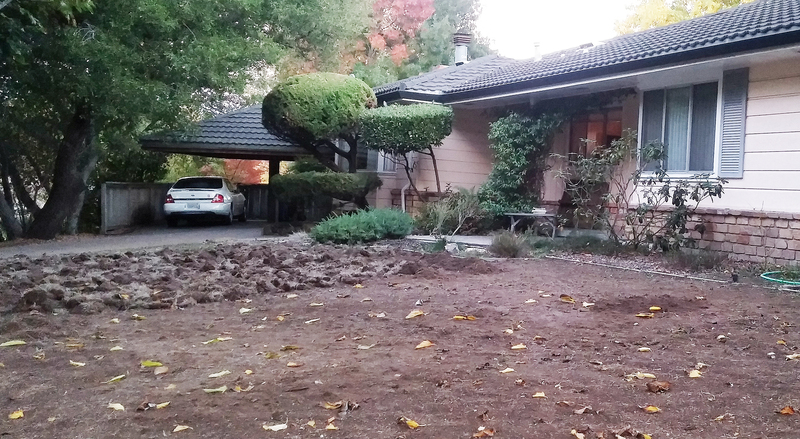 When I first got involved, most of the lawn had already been removed by hand. The client had also decided to do a cover crop for a season to regenerate the soil. 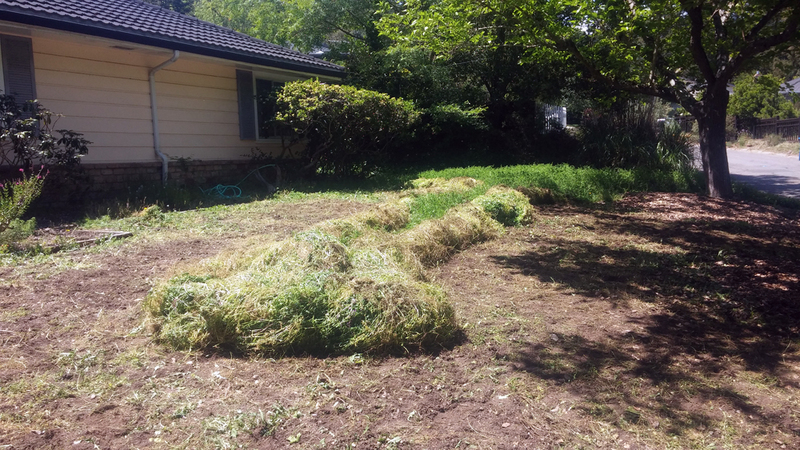 Generally, I think that by sheet mulching, the decomposing lawn will accomplish pretty much the same thing as a cover crop. But a cover crop is certainly another effective way to do it. This lawn had tired, depleted soil, and several Mulberry trees had roots everywhere that would compete with the new plants, so I’m sure the cover crop was beneficial. We used vetch as the cover crop. We seeded it just after Thanksgiving, gave it about five months to grow, and then removed it at the end of April. There are a few ways of dealing with the vetch. 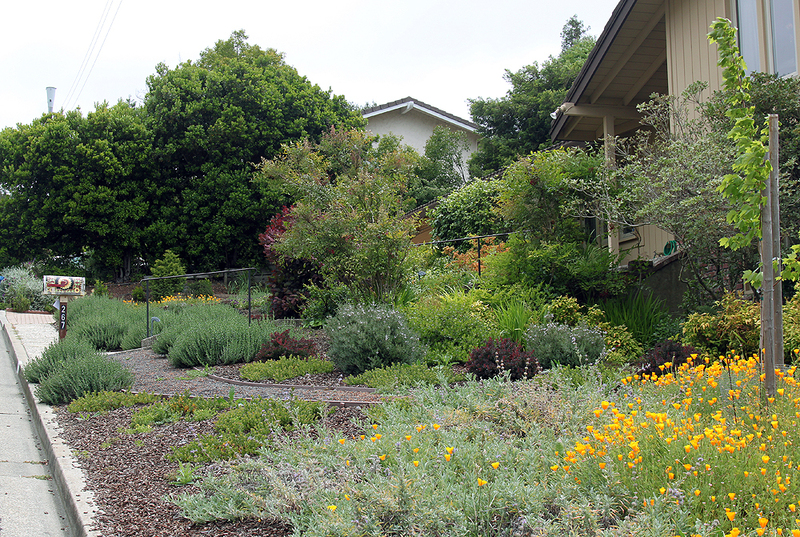 Most of the research and info about it is geared towards agriculture, and my experience with it was for lawn and veggie garden projects rather than ornamental plantings. 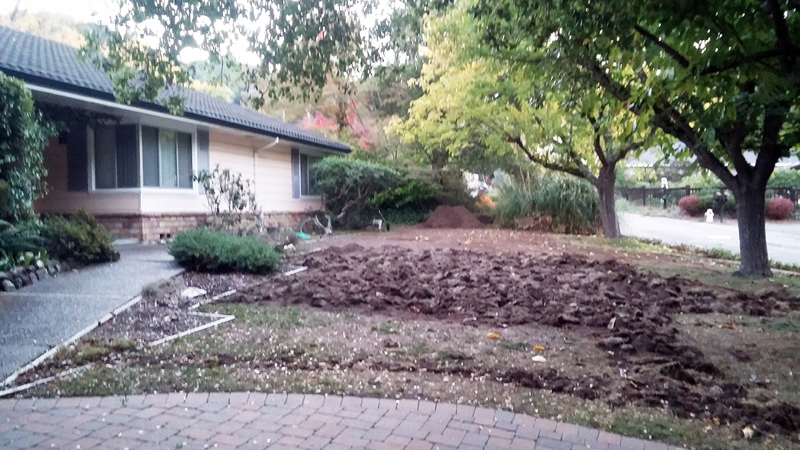 For the lawns and veggie gardens, I had tilled it directly into the soil. For this garden, to avoid disturbing the roots of the mulberry trees, we left the roots of the vetch in place and tore off the tops of the plant, chopped those tops a bit, and spread them on the surface to rot beneath the fir bark mulch. Supposedly that gives less nitrogen gain, but the layer of vetch helps retain moisture in the soil. I don’t really know, there are too many variables to conclude anything other than that the planting did well enough with this method. 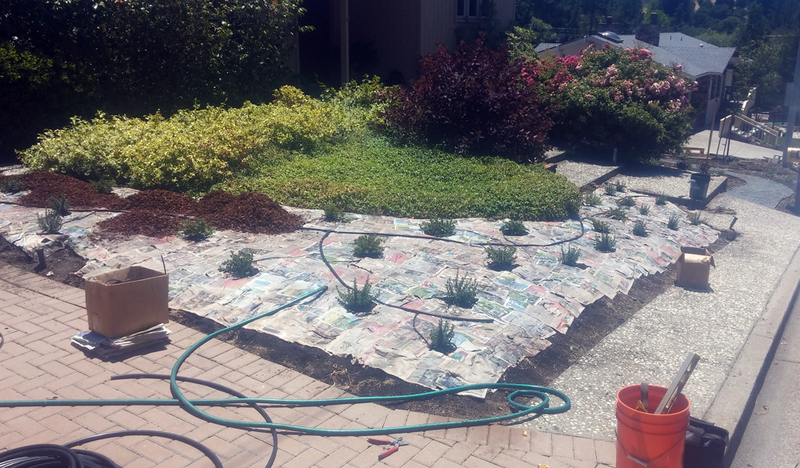 I’m still partial to sheet mulch and generally still recommend that method, but I’d be happy enough to do it again this way. Seeing the vetch grow throughout the winter was fun, and rolling it away in the spring went quickly and was actually kind of fun too. I was worried the vetch might reseed itself and make a mess in the new planting, but as far as I know it hasn’t been a problem. The photo below was when we were half way through removing the vetch. 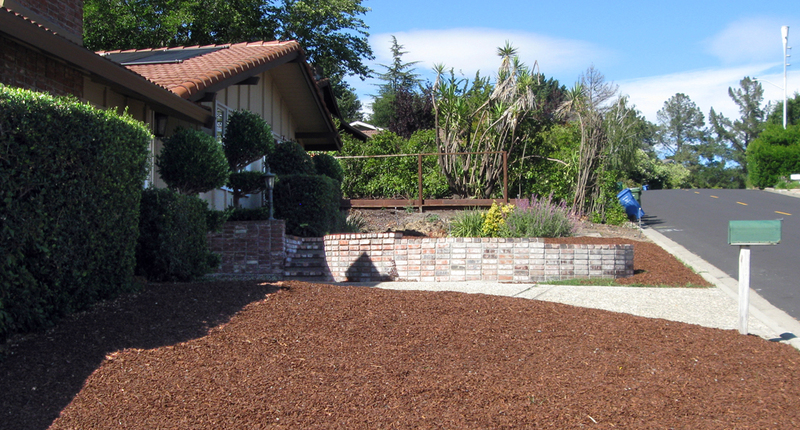 Above shows the new planting with the dried out vetch hidden beneath the fir bark mulch. Below is what it looks like now after two years of growth. This, with the Bearded Iris in bloom, is the showiest the planting gets. They’re pretty much the biggest flower I know that won’t get eaten by deer. 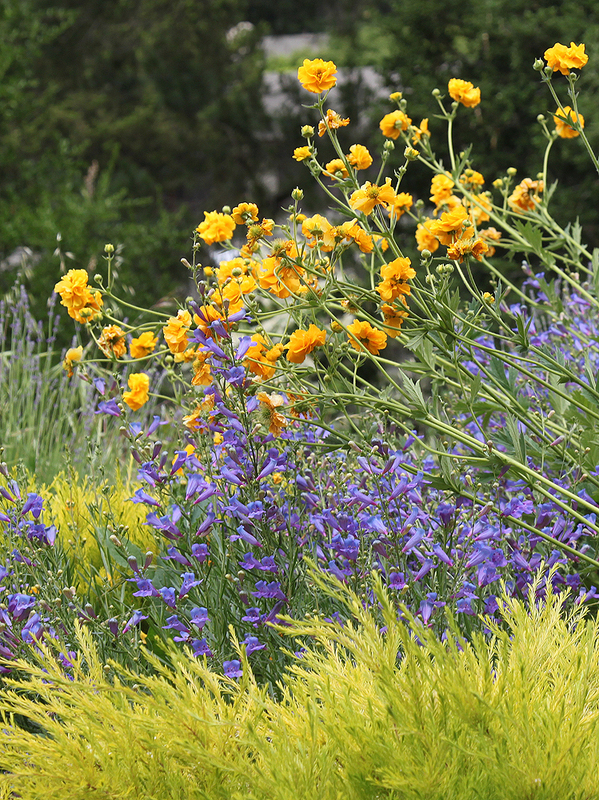 Next month there’s a fair bit of Teucrium, Linaria, and Verbena to bloom, but those make a lot of little flowers. For this garden, I like seeing the fist-sized purple flowers. 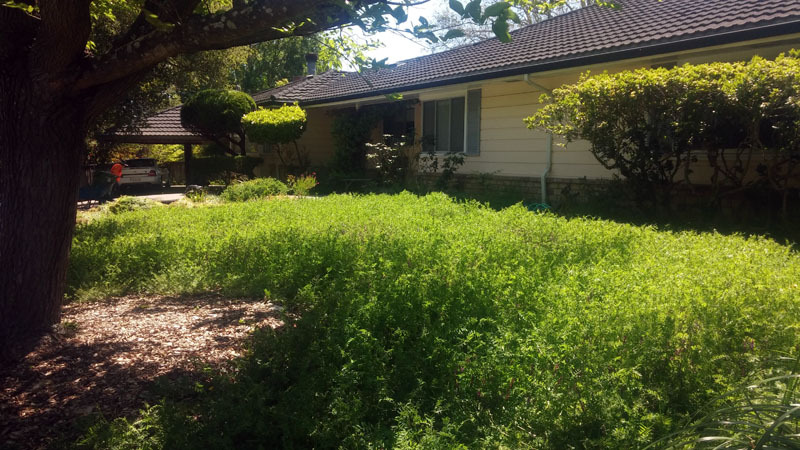 Below is the view of the garden from the other direction, starting with google earth’s view of the lawn, then the space after the lawn was dug out, with the vetch growing, and how it looks this spring. As I said, I was worried that the vetch would reseed and make a mess the next year, so we removed the vetch bfeore it could set seed, and we also spread corn gluten seed inhibitor throughout the planting as well. I don’t know if the corn gluten made an impact or not. I use it sometimes but have never had a control group to compare and decide if it is actually effective. 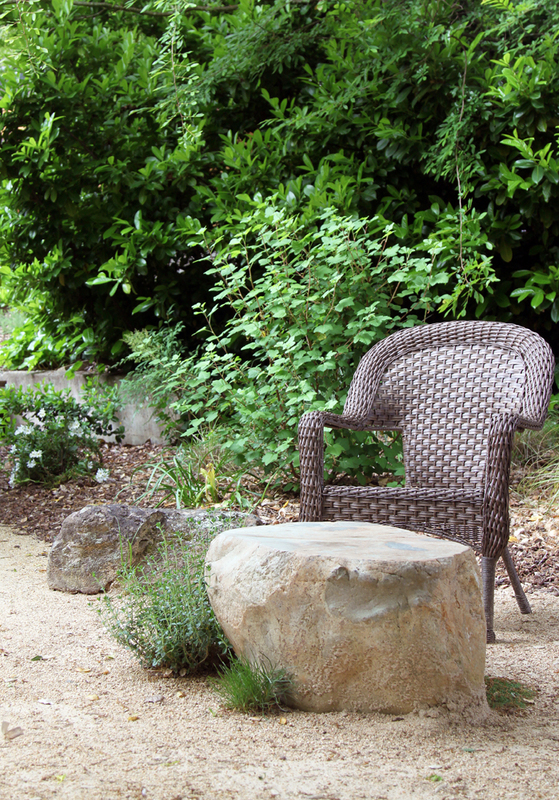 As part of the new planting, we made a path and a seating area, the client had some chairs that we put around a boulder with a sawed off top. The photo above is the view from one of those chairs. 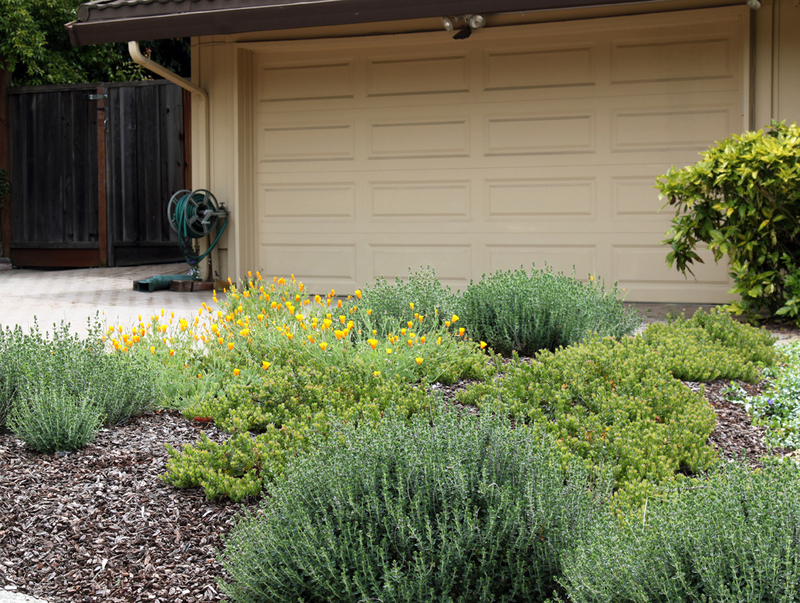 So much nicer than a tired old lawn. This past weekend was the Bringing Back the Natives Tour. 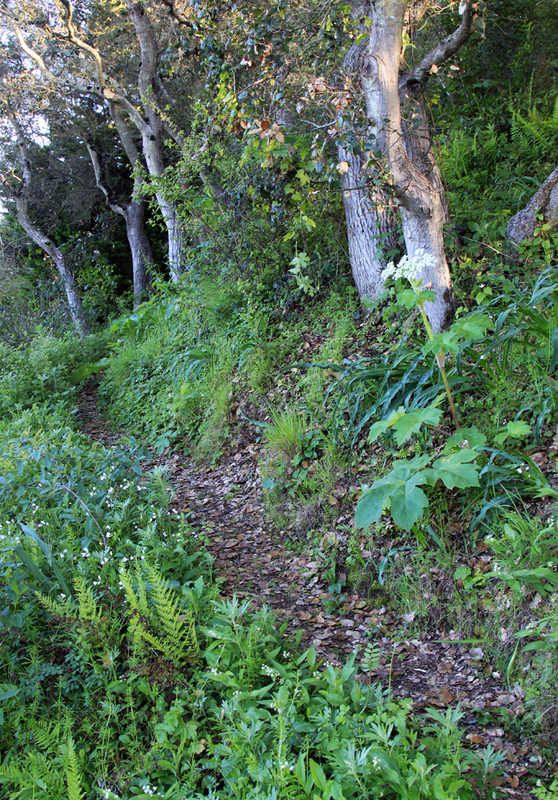 I spent Sunday afternoon volunteering at a garden that we maintain, Carol Baird and Alan Harper’s garden in the Oakland Hills, an extensive garden on five acres overlooking Redwood Regional Park. It’s a tremendous garden and there’s a lot I could say about it, but this post just scratches the surface. I’m sure I’ll post about it again at some future point. 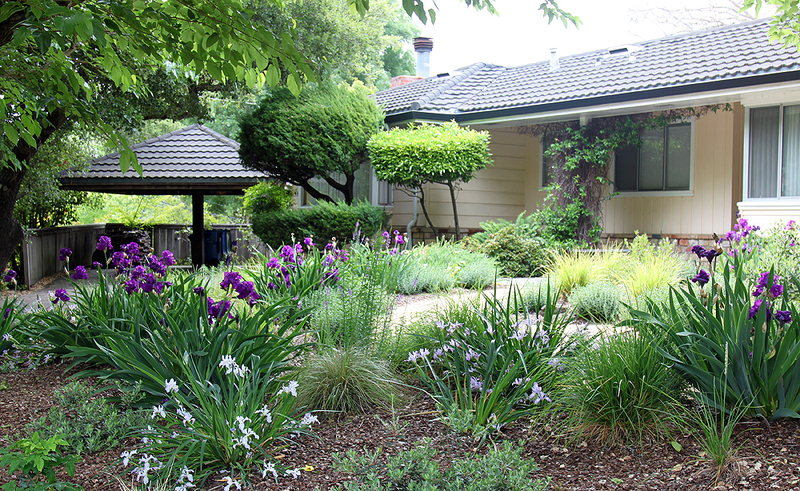 To give an overview, the house and garden were put in about fifteen years ago. Roger Raiche, who I have mentioned on this blog before, planted the garden, imprinting the main areas around the pool and entrance with his signature style — closely-spaced interwoven plantings, an extensive variety of plants, lots of chartreuse and variegated foliage, strong forms, bold contrasts. Afterwards, the maintenance gardener began weeding and taking out blackberry thickets on the rest of the property using the Bradley method (a quick primer: be patient, start in the area with the fewest weeds instead of the area with the most weeds, try not to disturb the soil as you work so that you won’t encourage weed seeds to germinate, and clear out weeds only as fast as you are able to establish new plants in their place), restoring a lovely section of oak woodland and making quite a bit of progress on a grassland area. She retired two years ago and we took over the maintenance, continuing to use the Bradley method in the restoration areas, as well as making some upgrades in the area around the house. 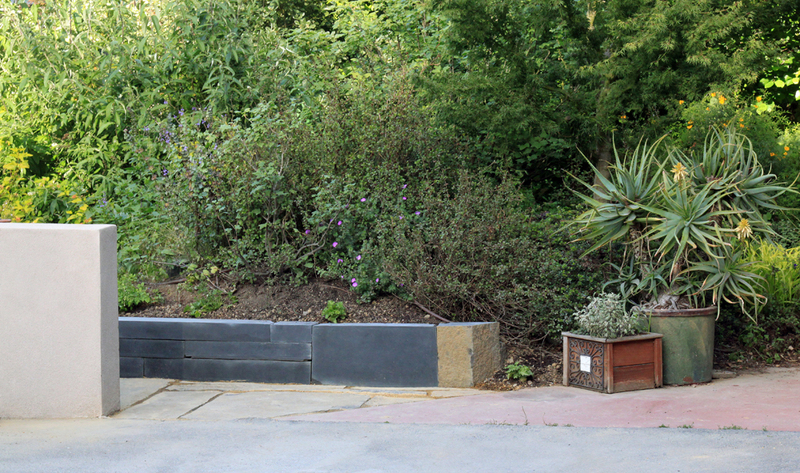 The trellis in the photo above is new, recently added for the climbing rose, and I’ve done some stonework in a couple of areas, including this little basalt wall next to the parking area. 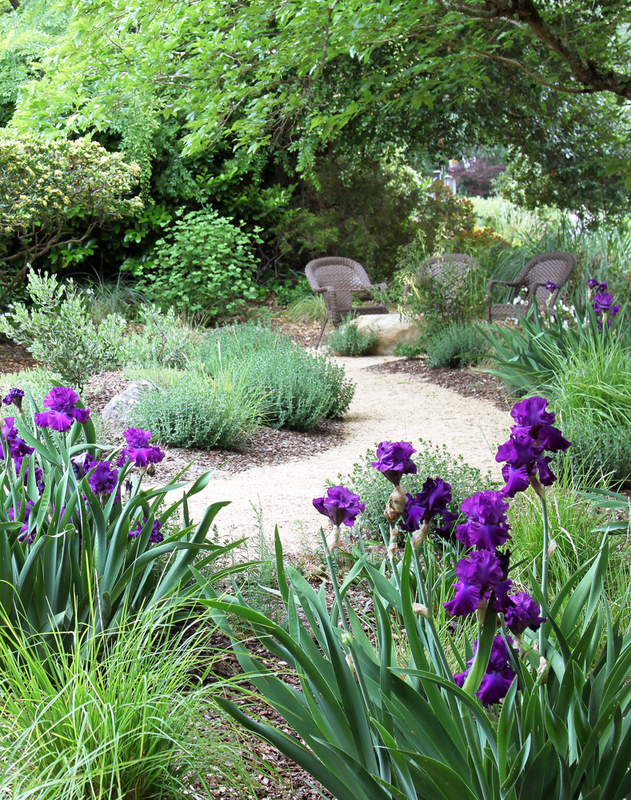 Some of these photos include flowers but more than anything this garden is a celebration of foliage. Roger Raiche’s concept was ‘Every shade of green’ and I can attest to there being just about every shade imaginable. 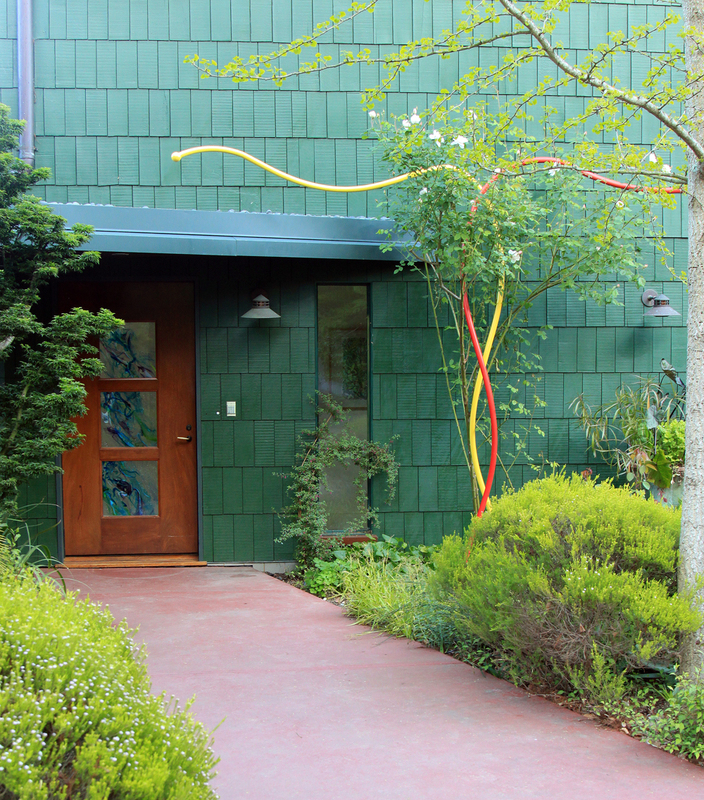 A lot of the foliage is set to contrast, but there are also a lot of interesting ways that the colors and forms are carried from one plant into another, such as the way the green striping on the Phormium echoes the Berkeley Sedge in the photo below. 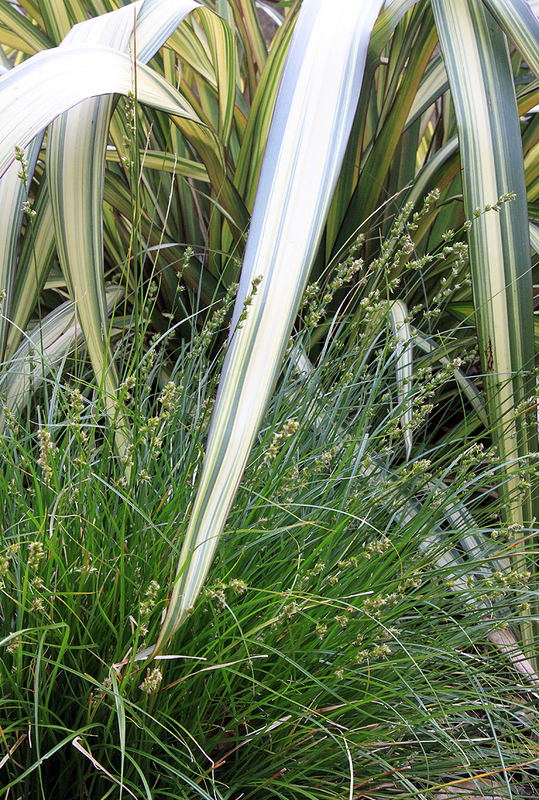 At first glance the stripe looks like a blade of the sedge, and even after your eye recognizes that the stripe is part of the strappy Phormium leaf, it still looks a little bit as if the sedge’s green has been somehow injected into the Phormium. Plant design is about combining plants to create a greater whole, and this is a subtle but masterful example of that, made even more impressive to me because both plants are fairly run of the mill. I see them in a lot of gardens, but never combined together like this. Roger Raiche was in charge of the native plant area at the UC botanical garden and he used a lot of natives in these plantings, including this clever use of Western Spicebush, Calycanthus occidentalis, to drape over a ten foot retaining wall along the driveway. 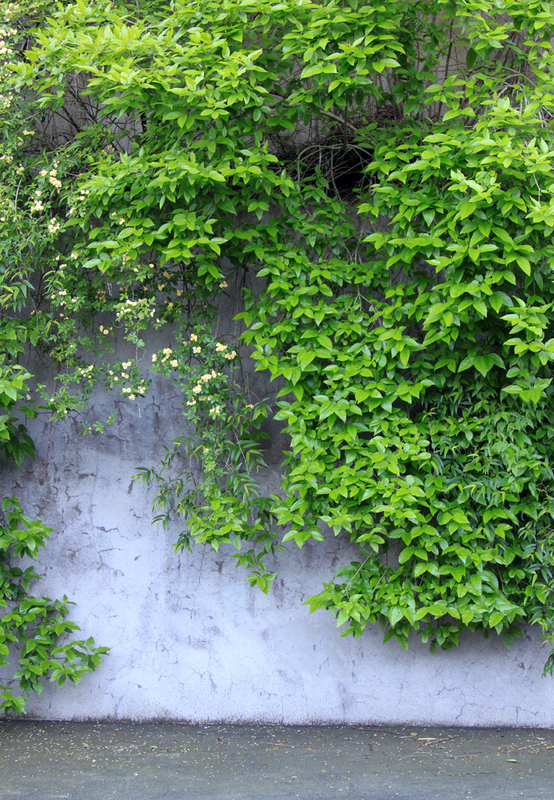 I’ve never seen Spicebush used like this anywhere else; it’s effective and easy to maintain, casually matching the scale of the wall. 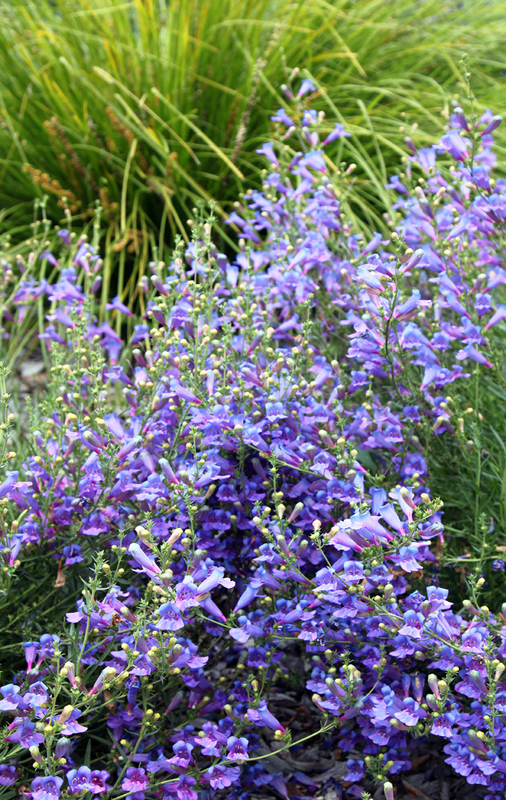 The majority of the natives in the garden, however, planted themselves. 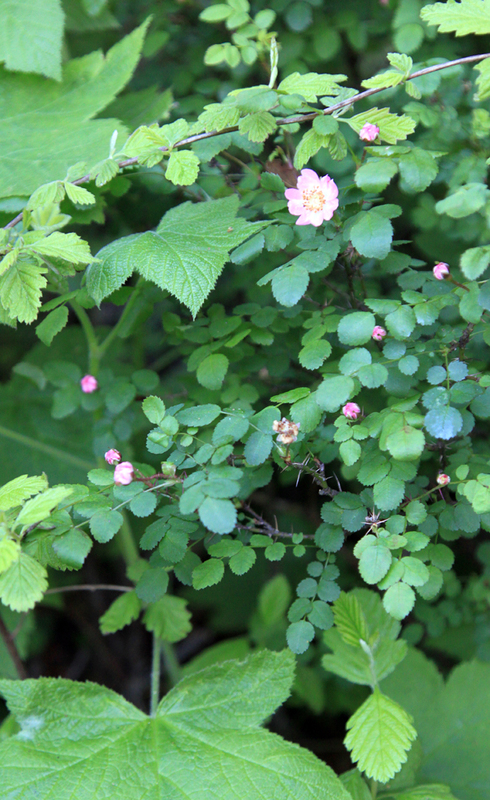 Anita is more involved with the restoration and maintenance than I am, so I don’t always know for sure what was planted and what came as a volunteer, but a tremendous variety of native plants were uncovered from the blackberry thickets or seeded themselves afterwards. 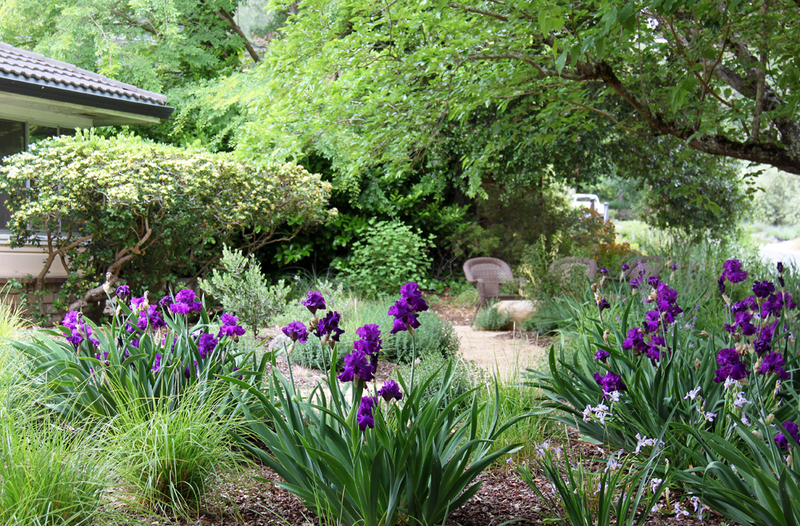 I love the combination of plants in the photo above, a beautiful woodland mix as pretty as anyone could hope to design. I put the other photos from the slideshow below. You are currently browsing the archives for the private gardens category.